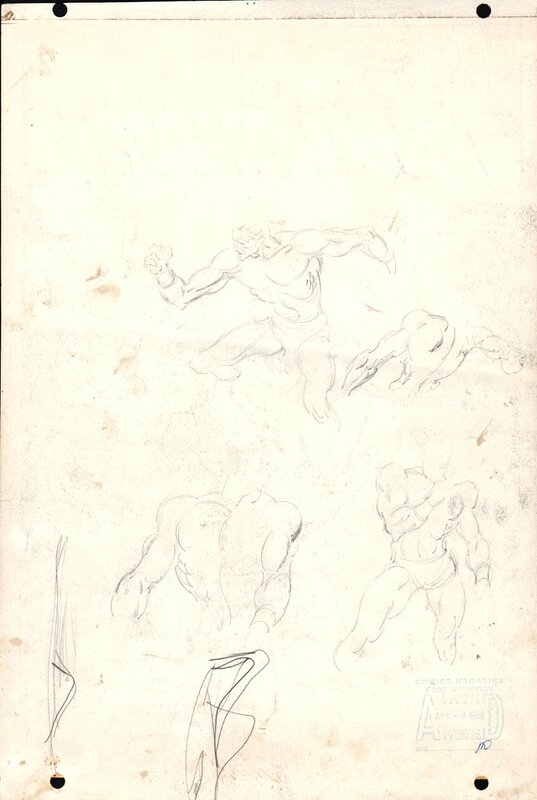 Click Here To See John Buscema Drawings On Back Of Page! Click Here To See Sub-Mariner #5 Comic Book! "IMPERIOUS REX!" 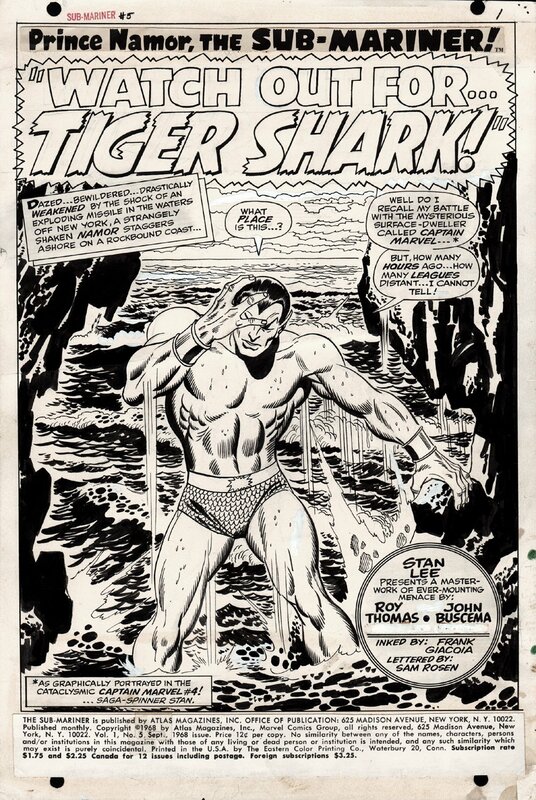 Check out this "STUNNING" 1968 SILVER AGE MARVEL SPLASH, which was penciled by the great John Buscema, and inked by the equally great Frank Giacoia, from the classic 5th issue story titled: "Watch Out for... Tiger Shark!" This "COVER QUALITY" Sub-Mariner SPLASH features a large Subby, dazed and confused after his battle with CAPTAIN MARVEL from the previous issue! 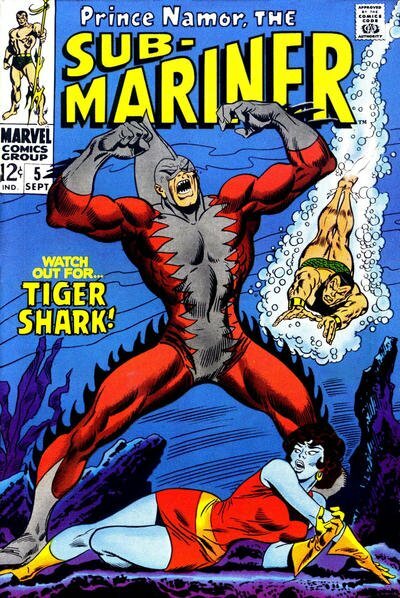 This issue marked the VERY first appearance for the gene-spliced recurring "Tiger Shark" villain. The art board has a light horizontal crease through the image area which has been pressed flat, with only a small visible crease visible. As an extra bonus, there are loosely penciled figures on the reverse side by John Buscema Which can be seen in the extra red link above. If you ever wanted a nice LARGE "EARLY" John Buscema Sub-Mariner SPLASH for your collection, It doesn't get much better than this 1 right here folks! SILVER AGE 1960s Marvel Super hero SPLASH pages are VERY hard to find in the hobby these days, so don't miss out on a great opportunity to own a GREAT FIRST YEAR Sub-Mariner TITLE SPLASH, drawn by the late great John Buscema! ALL art on our website (including this one) are able to be purchased with VERY fair time payments, and trades are always considered towards "ANY" art on our website! Just send us an email to mikeburkey@aol.com and we can try to work something out.